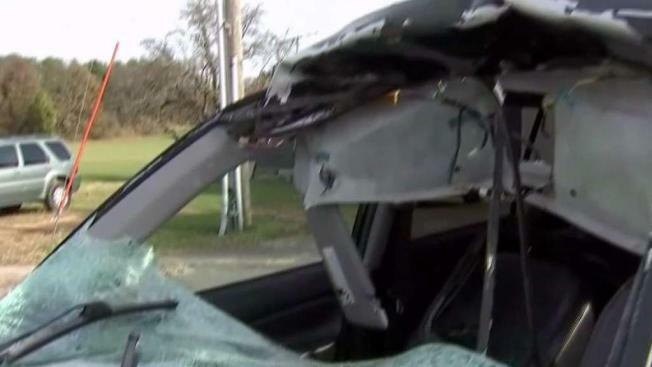 A big buck crashed through the windshield of a woman driving on a New Jersey highway. A deer jumped into traffic on a New Jersey highway, then flew airborne and smashed into a woman's SUV, crashing through the windshield, onto the passenger seat and landing in the back of the vehicle, authorities say. In a Facebook post, the Howell Township Police Department says the deer ran onto Route 9 Monday morning -- right into the path of Melissa Misthal's Rav4. The 36-year-old woman swerved to avoid the animal but it rammed her SUV while airborne, police say. The force of the impact sent the deer into the passenger seat and then into the back; the windshield collapsed, as did the roof of the vehicle. The deer still in her car, Misthal managed to pull her SUV over to the shoulder. She was treated at the scene for a minor injury. The deer died. Police praised the actions of Misthal, though, which they say helped prevent additional accidents and injuries.